A diver anchoring to a simulated asteroid surface created for NASA's underwater NEEMO 15 mission. A team of astronauts, usually known for traveling upwards, are now preparing to head down into the deep. NASA has announced its newest undersea mission, a 13-day voyage 60 feet (18 meters) into the Atlantic Ocean to simulate a trip to an asteroid. The trip will include six astronauts, as well as noted Mars planetary scientist Steve Squyres and two professional "aquanauts." NASA astronaut Shannon Walker, who previously lived and worked on the International Space Station for five months in 2010, will lead the crew during their foray to the Aquarius Underwater Laboratory 3 1/2 miles off the shore of Key Largo, Fla. The expedition is set to start on Oct. 17. The NEEMO 15 mission is the first to simulate an asteroid visit. Previous underwater missions have rehearsed moonwalking, assembling space station modules, and even visits to Mars. The new NEEMO crew will test various methods of anchoring to an asteroid's surface, moving around and collecting data. The astronauts and aquanauts will practice moving along a surface without gravity, and try out strategies for deploying instruments. Canadian astronaut Jeremy Hansen and Jeanette Epps of NASA will talk to the NEEMO crew from Mission Control as capsule communicators (capcoms). James Talacek and Nate Bender of the University of North Carolina, Wilmington, are professional aquanauts, or divers who specialize in working underwater. 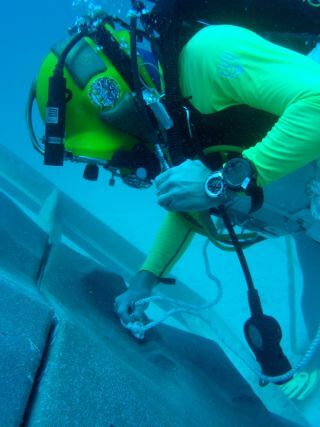 "NEEMO 15 will require complex choreography between the submarines and aquanauts living and working in their undersea home," NEEMO project manager Bill Todd said in a statement. "Researching the challenges of exploring an asteroid surface in the undersea realm will be exciting for fans of exploration pioneers Cousteau and Armstrong alike." To prepare for the mission, divers worked during the spring and summer to set up a simulated asteroid landscape on the sea floor. A 16-by-12-foot fiberglass wall will allow the explorers to practice drilling to anchor to an asteroid's surface, and using metal plates for magnetic anchoring. The mission is a collaboration between NASA, the National Oceanic and Atmospheric Administration (NOAA), which owns Aquarius, and the University of North Carolina, Wilmington, which operates the ocean lab.